"Dean is asking the right questions about online life … We certainly need vigilance and critique to help us resist dotcom charisma, and no one is fiercer or smarter than Dean on this front." 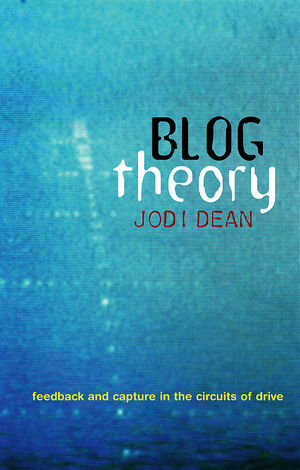 "Jodi Dean’s Blog Theory takes as its proximate subject the eponymous blog—and its living death … what is offered is both simple and, oddly enough, also hopeful." "If Ballard invited the 20th century viewer to witness their own mass atrocity exhibition, we now have the update for the 21st century: Jodi Dean's demolition job of the Internet as we know it. With Blog Theory we can finally terminate the hype of blogging and seriously engage the deeply distracted condition of the networked present. The incestuous relationship between journalism and bloggers is exposed to make way for critical reflections on techniques of self-management for our all-too-fragile identities." "Blog Theory is refreshingly free of received ideas about the wonderful new world of media. Jodi Dean manages the difficult art of being critical of new media without becoming a cranky curmudgeon. She uses psychoanalytic concepts to produce a synoptic view of the decline of symbolic efficiency under communicative capitalism, and the way the blogosphere participates in this dissipation of the totems and tokens of what we once thought of as the public sphere. She clears the way for imagining the politics of media by other means." A leading media theorist engages with the world of blogs and social networking sites. Jodi Dean is well known for her work on media theory and what she calls ‘communicative capitalism’. The book is a highly original reflection on the way we communicate and think in new media like blogs, Twitter and Facebook. This should appeal to students interested in new media. It is cutting-edge theory in the field of new media.